WrestleMania is once a year but Pay Per View’s are once a month so let’s have some fun with WWE Party Food with Pun Names! We always enjoy hosting our annual WrestleMania party. The pun named food is a favorite aspect of the party. One of my grandson’s challenged us to all come up with even more pun named party food this year. Text messages were flying for over a week with new ideas. This is not a collection of recipes, just Pun names for WWE party food. This list is updated from time to time as new characters come in. We are working to add more Women’s Division Pun Name Food Ideas to the list. If you have some good ideas, please leave them in the comments. Have I ever been to a WWE live event? More than one folks. My husband is a WWE fan from way back, since being a small boy. We have to choose our battles in life and this ain’t one of mine. We take our grandson’s when the WWE is in town. Here are some photo’s from a couple of those trips. Stacy always makes posters with the boys. Several of their posters have been signed by the wrestlers so they treasure those and keep them in their rooms at home. I recently saw BexChex as a Becky appetizer. For a dessert there’s Alexa Bliss Bars (normally cranberry bliss bars). LOVE all of those and you are so right about Shane-O-Mac & Cheese! Gotta have that!! Thanks for stopping by Angela. Trust me when I say, the audiences are full of women too! I like that one! Thanks for sharing it with us! How funny, I used to watch WWE when it first started to get popular and these just crack me up. Isn’t it a hoot. I’ve been enjoying chatting with one of my grandson’s and my brother-in-law all week about the Pun names. The main thing my grandson is concerned about is me making his favorite dish for the party. Looks like a fun thing to do Shirley. Some of the food names I do not recognize..LOL! How neat though that you get to go the WWE games (well, that you go for your hubby’s sake). 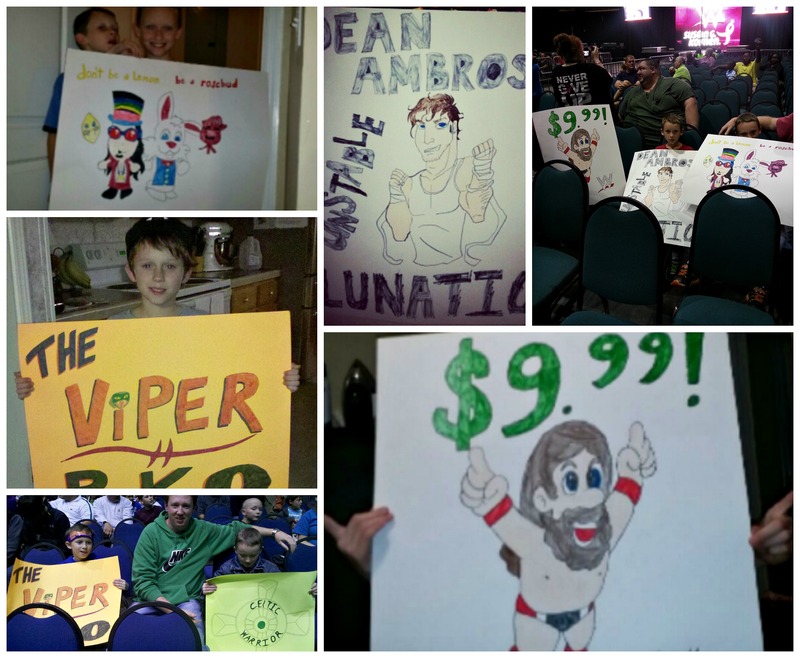 And that he is so artistic and makes those fun posters that the boys even get signed by the wrestlers. The posters are part of the pre-event hype they all enjoy. We don’t go every time they come to town but just sometimes, it’s costly. I like the fact that the fella’s all bond with the WWE. What a great memory maker for your grandson. You are so clever! Thanks Mary. We enjoy making memories with our sweet grand children. I hate to admit that I know absolutely nothing about WWE wrestling! I did have a friend in middle school that loved it and if I was at her house on a Saturday, we’d be in front of that TV, small glass bottle of Coke in hand, watching WWE. 🙂 I’m a huge college basketball and football fan, but am ignorant when it comes to WWE. I love all the Pun names for the party foods. Some of them are really amusing. My husband started watching wrestling as a child and still enjoys it. He and his brothers chat about it. One of his brothers comes to our house for the Pay Per Views and it makes me smile to see them enjoy their time together. Stacy has gotten the grandson’s interested for years now. They love spending the night at our house for the annual WrestleMania party.